Which allows us to carry out water pipe repair and replacement with out the need to excavate, this technology allows us to install new pipe work with out disturbing the existing surfaces, all our work is fully guaranteed and we issue a 10 year guarantee and also a certificate of approved installation. We have specialize moling equipment which allows us to carry out water pipe repair & replacements with out the need to excavate, this technology allows us to install new pipe work with out disturbing the existing surfaces, all our work is fully guaranteed and we issue a 10 year guarantee and also a certificate of approved installation. What will it Cost Me the cost to change my lead pipe is will depend on the length of your garden from the boundary of your property to the connection point inside your property this is simple just give us a call and we can give you an exact price over the phone of what it would cost you to replace or repair your lead pipes. For a long time lead has been considered as a very useful material that can be used for a number of purposes such as electronics, plumbing, paints and a lot more. But after that studies have shown that this same lead can have harmful effects on the human beings and mainly in the children under the age of six and can also cause damage to the fetus if water that contains lead particles. The lead pipes were previously used for the domestic purposes but afterwards it was find that the eater sometimes picks up small particles of the lead which if consumed can have bad effects on the health. Though newer properties do not have lead pipes, the older ones especially the ones build before the 1970 s usually have the same lead pipelines. Lead if consumed through the drinking water can cause a range of health hazards in infants and children. It can cause to slow the rate of development, both mental and physical, in the children. In adults, drinking water containing lead over a long time period can cause high blood pressure, and also kidney problems. Lead can’t be naturally found in water and the only way it can get mixed with water is through the lead water pipes. Due to corrosion which is the erosion of the metal as a result of a chemical reaction between water and the plumbing, lead gets mixed with the water stream. In what amounts the lead would be present in the water depends on the amounts and the types of the minerals in the water, how long the water is in the pipe line and other factors. Thus to avoid such health hazards the old lead pipes should be replaced with a new blue poly MDPE pipe as soon as possible. The more it is delayed the higher the risk of contamination. Replacing the lead pipe can be the first and the foremost measure. Installing a filter for drinking and cooking water can be another measure to avoid using water mixed with lead. If one is living on a property that has been built in the 1950s or the 1960s then it is more likely to have lead water pipelines. It is better to have both the sides of the lead pipe replaced in order to make sure that there is no chance of the water getting contaminated. By replacing the lead water pipes one can ensure safe drinking and cooking water for the family. 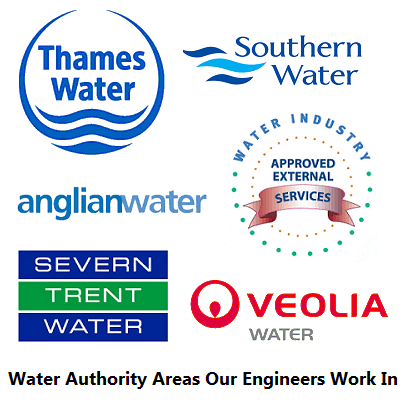 Our experience allows us to understand the water network system and offer a professional and high quality Water Pipe Repair Service.